Fracture is the breaking of bones, but if there is stretching in ligaments (tissues connecting bones at joint), then it is called sprain. Fracture happens in arms, elbow, wrist, hands, legs, ankle, foot, toe whereas Sprain happens mostly in ankle and wrist. Maximum fracture happens due to high force impact or stress. Strains occur due to excessive force applied to a joint like ankle, wrist. Fracture are many types but mainly categorized as simple, compound, complete and incomplete. Diagnosis of fracture is done through X-ray, MRI, CT scan while Sprain can be easily diagnosed by health care professionals and if not they advised for X-ray. Meaning Fracture is a breaking of bones in arms, elbow, wrist, hands, legs, ankle, foot, toe. Stretching of ligaments especially in ankle or wrist. Causes Accidents fall, sports injuries or from osteoporosis (bone weakening). Falling, hitting or twisting can cause the sprain. Symptoms and Signs 1.The patient is unable to move the affected area, swelling, pain, bruising. 2.Angulation: The bone of the affected area bent at an unusual angle. 3.Deformity in the affected area. Pain, Swelling, Bruising, not able to move the joint. Diagnosis X-Ray, MRI, Bone Scan, CT scan. There will be pain, swelling, redness, numbness. Treatment Treated by Cast or Splints. Mostly sprain get recovered with time but in few cases physical therapy or surgery ae required, but best is RICE formula i.e. Rest, Ice, Compression, and Elevation. 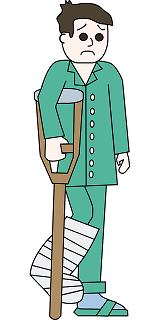 The fracture can occur in any bone of the body, usually ‘break or crack’ is the word used for fracture. Bone can get fractured into pieces, crosswise, lengthwise, or in many places of the body (multiple fractures). The fracture caused by disease (medical condition) are termed as pathological factors, fracture results in weakening of bones. There are various types of fractures but mainly categorized as Simple and compound fractures, complete and incomplete fractures. Simple and Compound fractures: Simple fracture is also called closed fracture in which there is no open wound on the skin but bones break. Simple features include Transverse, Greenstick, Impacted, Oblique, Comminuted types of fractures. Compound Fracture is the break of a bone in which broken bone is visible through the skin; it is also called open fracture. Complete and Incomplete fractures: A complete breaking of a bone whether into pieces or two is called as a complete fracture. Greenstick fracture is the example of incomplete fractures, occurs in long bones results in discontinuation of bones. Diagnosis of bone fracture is done by health care professionals by examining signs and symptoms of the patients or by X-ray, MRI (magnetic resonance imaging), or CT (Computed Tomography). Treatment of bone fracture can be done by a plaster cast, metal plates, and screws, intramedullary nails, extra fixators. Although healing of bone is a natural process, which takes two-eight weeks to get rejoin and functional till then, the patient is advised for bed rest and to keep the fractured part immobilized. More than 99% of the body’s calcium is found in bones and rest 1% is found in blood. Hence it is necessary to maintain that level by taking properly balanced diet which has the adequate amount of calcium like milk, cheese, green leafy vegetables. Importantly sunlight, eggs, and fishes are also good sources of vitamin D. Along with that one should do physical exercise which helps in strengthening the bones. In women’s due to menopause the level of calcium decreases resulting in weakening of bones, hence it’s necessary to maintain that level. When one or more ligaments are stretched, torn, or get twist it is called sprain. When excessive force is applied to the joints like ankle or wrist or sometimes thumb, the sprain occurs. The sprain can be diagnosed by going to health-care professionals where he will advise for X-ray. The affected area will also pain, unable to move the joint, swelling may occur. Sprain treatment can be done at home if it is minor by applying RICE therapy where R is for rest, I is for ice, C is for compression, E is for elevation. The patient can also consult with doctors if there is a lot of pain. Prevention of Sprain can be done by maintaining the properly balanced diet to keep muscles strong, avoid playing or exercising during pain, follow safety measures while work or doing physical activity. Both the words like Fracture and Sprain are closely related, common people may get confused for the same but following are the main differences, which may be helpful in making out the difference. Fracture is the breaking of bone, whereas Sprain is stretching of ligaments (which are soft tissues which connect bones at joints). The fracture can happen in any part of the bones like left, hands, toe, ankle, foot, wrist, arms, but sprains usually occur in joints like ankles, wrist. The fracture may cause due to accidents fall, sports injuries or from osteoporosis (bone weakening), while sprain occurs due to falling, hitting or twisting can cause the sprain. The fracture can be treated by Plaster cast or splint; Sprain is treated by RICE therapy. Fracture and sprain are very common case occurring everywhere. People should take care of themselves by taking proper diet, by doing proper exercise. As fracture and sprain results in body pain, and proper rest is required for healing.